Civil engineer Adilson Benedito Maluf was mayor of the city of Piracicaba, by the Brazilian Democratic Movement, MDB, in 1974, when the I Humor Hall was created. He was elected mayor at the age of 29 and was later re-elected, developing intense activity in the intellectual field and giving to the then Municipal Department of Tourism, the most comprehensive denomination of Municipal Secretariat of Cultural Action. He is a worthy partner of the AHA, Association of Friends of the Humor Hall of Piracicaba and a great incentive for cultural and social projects in the city to this day. 4.2) The drawing must be presented in a single face in digital format - pdf jpeg. 4.3) Attached to the drawing must be attached the registration form. 4.4) The drawing must be unpublished and prepared by the authors especially for this contest. 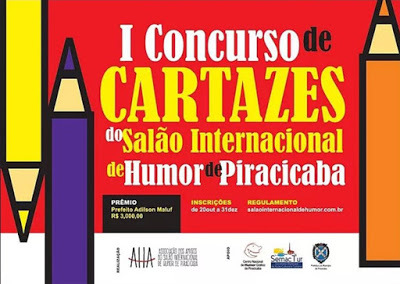 The judging of the posters will be done by the Evaluation Commission, made up of seven people who stand out in the field of graphic humor in Brazil. The 1st place will only be awarded, with the value of R $ 3,000.00 (three thousand reais or the equivalent in foreign currency, if the winner is from another country). 7.1) The delivery of the original drawing in digital format and the printed registration form, by the author, per se constitutes registration and participation in the contest, also importing in full instrument acceptance by the competitor of the rules established for the same. 7.3) The promoters of the contest are authorized, free of charge, to use the winning work, as well as the images obtained in materials and events, for dissemination purposes in publications, materials and events of the institution, provided the authorship is cited. The omissions in this regulation will be solved by the board of AHA, Association of Friends of the Hall of Humor of Piracicaba.